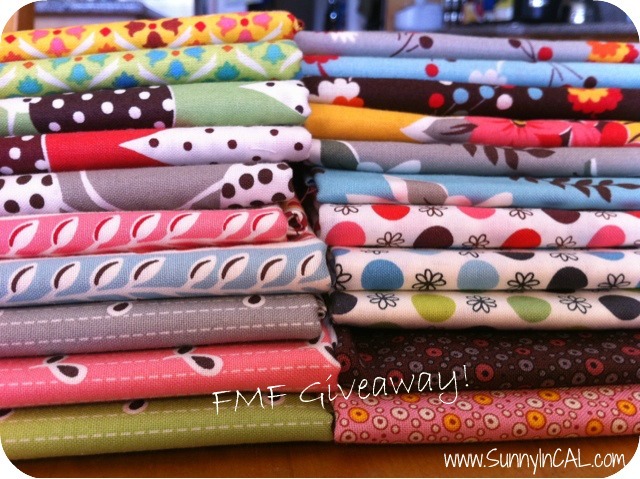 Sunny in CAL: Flea Market Fancy Giveaway!!! So, I know tons of you were excited about Denyse Schmidt's Flea Market Fancy Legacy re-release! I loved this line when it first came out and I still love it. I bought some, and since I'm behind on so many projects... I decided that I'd love to giveaway a FQ set to just my peeps! That's right! My followers! 1. Leave a comment....Tell me how long you've been sewing/ quilting. That's it! Easy Peasy! Winner will be announced Monday evening. Good Luck! I started quilting at the age of 20 in 2001. I am a longarm quilter, I have been doing that for 10 years! I have been a follower of yours for awhile!! I have been sewing for about a year off and on and have been a follower for a little while now! I've been sewing off and on since a kid, but with a mom who despised sewing it was pretty infrequent - school & 4-H projects. August of 1997 was when on made my first quilt, all on my own. Then in 1999 I started quilting on a regular/obsessive basis and haven't stopped since! I'm following! I found your blog through Flickr. Weellll...I started my first quilt 15 years ago, but I didn't finish it! Besides pillows, pillow cases, and a duvet cover, I've not made a quilt till this year, with wall hangings and minis. I'm trying to fix that! I found your blog through flickr and I've been following since! Wow! Super generous. I'm a new follower :). I've been sewing for about 3 years now and made my first quilt about 2 years ago. Always wish I had more time! Hi, I just found you through flickr. What a lovely giveaway. I'm a brand new follower as of today. Hi and thank you for the giveaway. I've been quilting for the past 30 years! I've been sewing and quilting for about a year and a half. In that time I've "hoarded" tons of fabric! I've been sewing for years, took a break during college and rediscovered it again in 2008. I like to say I collect fabric :) really, I love to use my fabric, there just aren't enough hours in the day to do what I love. I started quilting back in the 1990s, but I only made about three quilts and then stopped. However, after getting back into quilting and sewing after a move last June, I can certainly tell it is more of an obsession than hobby this time around. The fabric and patterns are so much more exciting than they used to be! I have been following you for quite some time now and I thoroughly enjoy reading your posts!! Thanks for the extra chance to win! oooh, im lucky #50th follower! I sewed as a child in 4-H, took a class in High School then discovered quilting much later and made a hand full over the next decade but not many. In the last few years I've bumped it up a notch and have been quilting pretty steady - some might say obsessively! I've been a follower for a while now. Thanks for the shot at a give away. I've been quilting on and off since I was 16...so about 17 years now! But have only really gotten into it in the last 4 years or so. And I a am a new follower! Thanks for the chance! Sweeeet giveaway! I've been sewing all my life thanks to my Mommy but only started quilting three years ago thanks to blogs and flickr. What a fantastical giveaway! I still have not purchased this set but do need it! I've been quilting for the past 8 years and got into it when I found out I was prego with my little girl. I wanted to make her something myself, since everyone around me is mega crafty and knitted her stuff, sewed her outfits, etc. Oh my goodness! Yum! I've been quilting and fabric hoarding since 1999. I've been your follower for a while. What a nice give-away! I started sewing as a child, making stuffed animals out of found materials. This is my third year quilting, and it serves my fabric addiction well! Oooh, what a fun giveaway! I have been sewing since I was in grade school. Nothing serious until I moved away to college where sewing became my stress release. Now that I am out of school, I can really sew a lot more which makes me really happy. :) Thank-you for this chance! I started really sewing 4 years ago (I'm not including my horrible home ec disasters in 8th grade). My dog passed away far too young (7) and I was super depressed. So one day I just went out and bought a sewing machine. Not really sure what motivated me that day to start sewing, but it was one of the best decisions I have ever made. Even now it is great mental therapy for me and I love having a creative outlet. It is nice to have something positive come out of such a sad experience. I'm an "old" follower. Thanks for all of the great reading material! I've been at this since I was in middle school. I started out helping my Mom with quilts she was doing. I started my quilting addiction about a year and a half ago when I bought a new sewing machine. I just can't get enough! The fabrics in your give-a-way are just lovely! Thanks so much for posting them. I've been sewing since August of 2010, but it's been the most awesome thing! I love it! I've been a follower of your blog for awhile and I love seeing your work - so inspiring! I started sewing in junior high. I did the mending in our family, I also made my little sister's Halloween costume one year. I started sewing when I was 10 years old. My grandmother taught me. I am forever grateful to her for this. I have now been sewing for 45 years and quilting for over 20 years. 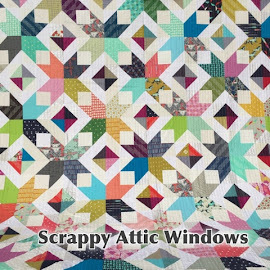 Quilt blogs have really given me so much inspiration in the last 2 years. I follow you via e-mail, but I click over to your blog to get the full experience. Thanks. I started sewing when I was little, maybe 10 or 12? I got back into it 6 years ago when my SIL taught me to quilt. So. Much. Fun. Ohhhh My Goodness Gurrrlll!! What a generous giveaway. You're the BOMB.com! LOL. Anyhow, I started taking sewing seriously about 3 years ago, prior to that my mom tried and tried to get me to sew, but I had no interest in it... WFT, was I thinking??? Oh yeah, I forgot.... I already follow you're awesomeness! Thanks for the great giveaway! I love your blog - it's so pretty! I'm following via e-mail! Grand giveaway.. it's FMF so I'm all in! I've been sewing since I was 6 or 7. Watching my mother was just too much. I didn't start quilting til around 2 years ago. But it really was inevitable. I'm a new follower.. but love what I see! Oh dear, was I supposed to put this in my first comment? I've been quilting about 6 months now. Collecting fabric for a bit longer. I have been quilting for about 5 years. And I learned mostly on my own but also with the help of a experienced quilter friend. At the beginning, my husband (who had home ec in highschool, I never took home ec) had to help me thread a sewing machine given to me by his grandmother because I had no idea how to do it! I started sewing clothing in the late 70's. Worked for a local fabric shop, and made a couple of quilted items. Fast forward to 2 years ago - I started quilting. LOVE IT! Thank you for the chance to win this. WOW! I am definitely a follower. Love your blog. I've been sewing since high school/middle school (so late nineties). I love to work with many different colors and patterns! I would love to win this bundle! Hi Jenn! I've been sewing on and off since home ec in middle school. Love your work! Sewing since high school (10year reunion coming up. EEK!) and quilting for a couple. It's my down time to let my brain relax. Hi Jenn. I have been sewing since i was about 3....thats a long while now...although i have dreamt of quilting for a long time have only really started quilting in the past two years. i have popped over here before but now i am following ....thank you again ! I started sewing when I was 13 and was instantly hooked. Back then it was mostly clothes but now it is mostly quilts! thanks for sharing suche beauties! i've been quilting for about 14 years now, but sewing since i was a wee thing! I have been quilting/sewing since October 2007! And I just started following your blog!! I made my first quilt in high school - so over 10 years. Yikes! I've been sewing for a long time, I guess I started when I was a teenager. I'm only just beginning to quilt. I've been sewing since high school - only discovered modern fabrics a few years ago. I just had my 2nd kid and haven't sewed in a while - i miss it! Also, I am a follower through google reader. :) Thank you for a great giveaway! 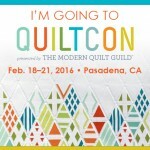 I've been sewing since I was a kid, but have become a die hard quilter in my free moments the last 8 years. I love the flowers on the side of your blog! That first impression made me a new follower. As a mom of 2 boys on west coast too, I look forward to your posts. Just followed you by email. I learned to sew from my mom and from home ec classes, but I started quilting less than a year ago! Love Denyse Schmidt fabric! I started sewing/quilting in 1997 when a friend sent me a yard sale sewing machine (still have it, still use it sometimes!). Then I got a part-time job at Joann's to offset the chaos of teaching in an inner city high school, and started collecting "calico" fabrics. I loved the process, but didn't love the product (And the RULES! Gah! ), so I quit. When we moved back from England in 2007, I purged ALL of my fabrics. I had zero left. I started sewing at the end of 2009 when I decided to try to make a quilt for my sister and use the sewing machine that was idle in my basement for 15 years. I've been quilting for about 7 years now. Thanks for the giveaway! !